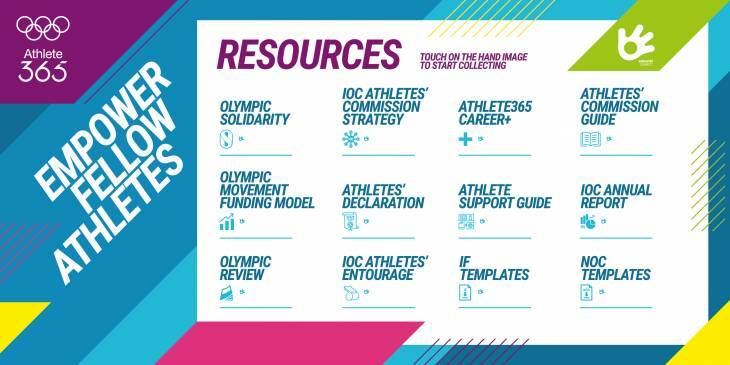 Athlete365 Network is the always-on International Olympic Committee Athletes’ Commission app that connects Athlete Representatives across the globe, supporting conversations, sharing best practice and continuing to drive the Athlete365 community forward. Think of this as the one tool to run your Athlete Commission communication; whilst at the same time connecting you to the Global Athletes’ Commission Network. During the forum, we will be using Athlete365 Connect to provide you with various documents and useful resources to help support you and your Athletes’ Commission. At the accreditation desk, you will receive a Smart USB KEY. This intelligent little device is packed NFC enabled and allows you to collect digital content via a touch. The Athlete365 Connect Smart USB also enables you to collect digital business cards with a simple touch. Just touch one Athlete365 Connect to another person’s, and they glow: You’ve exchanged business cards. After each day at the Forum, you’ll be emailed a daily summary of what you’ve collected. Click on the link within the email, or just login to your Athlete365 Connect Portal by plugging the device into your computer and you’ll be automatically taken to your dedicated space to retrieve and view all content and contact you have collected. We will have experts on site at the Forum for both Athlete365 Connect and Athlete365 Network so feel free to ask one of the Athlete365 Team at any time for assistance or advice on how to make most of both Connect and Network – together we’re building a stronger future.